Will Sparks, Allday, Slumberjack, Ivan Ooze, Tenzin, Gill Bates and Tigerilla. 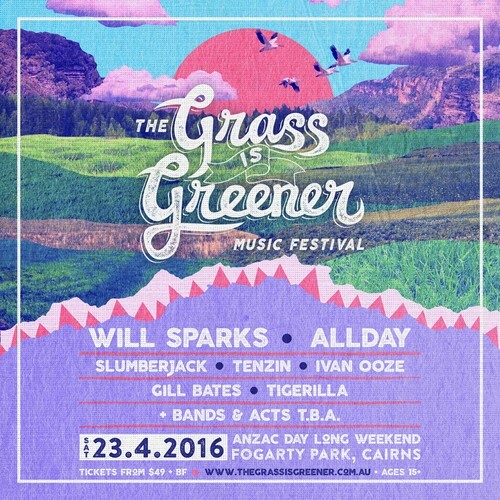 This April, The Grass is Greener is bringing you the best of Aussie talent in a brand new, boutique music festival. The Grass is Greener aims to foster and support our loved local artists, proudly implying that the grass is greener on our land. This brand new music festival is coming exclusively to Queensland’s own, iconic - Cairns. Be prepared for the Aussie sun, on the 23rd of April with TGIG taking place on the succulent, green fields of Fogarty Park. With one stage and one day, The Grass is Greener will be an experience not to be missed filled with Australia’s best Djs and acts. Tickets will be on sale from 0pm Monday 17th January.